This appendix on the role of adequate scientific theory in reading and in education generally is included for those who wish to study more closely the research foundations and policy implications of this book. It attempts to explain why it is essential to go beyond the latent breathless reports from on-site studies, which are, even at their best, inconclusive. Good policy is made on the basis of theories that are most firmly grounded in the whole range of relevant empirical studies. One of the most disdainful remarks in the hard sciences is that a piece of work is "atheoretical," meaning that it fails to relate the rele­vance of its factual findings to large complexes of phenomena and to more general scientific theories. Wolfgang Pauli once remarked about a scientific paper that "it is not even wrong." Scientists regard the formulation of theories about deep causal factors to be the motive of scientific progress — a view that has rightly replaced an earlier just-­the-facts conception of scientific advance. What takes the place of scientific theory in much educational discourse is educational philosophy, which tends to be either liberal or conservative. As Private Willis explained in Act II of Iolanthe, "Every boy and every gal / That’s born into the world alive / Is either a little liberal / Or else a little conservative." This partly explains the pattern of educational debates. Conservative "traditionalism" is often set against liberal "child-centered" education. Conservatives tend to think of human nature as something that needs to be molded. Lib­erals tend to think that the innate character of the child needs to be sympathetically nurtured and allowed to develop. Liberal and conser­vative theories of this sort are not lacking in American educational discourse. But that is not the kind of theory I mean in this appendix. Rather, I take the word in its scientific connotation, as a projection and generalization from what has been reliably learned in research. Taking the word in that sense, there is too little theory in Ameri­can education, especially with regard to ways of achieving agreed ­upon goals, such as attaining proficiency in mathematics, reading, and writing. These goals themselves are not subjects of debate. Disagreements about how best to achieve them are, in principle, scien­tific debates. Yet there is a notable shortage of thoughtful scientific theory within educational discourse. That may be partly because ed­ucational research data tend to be uncertain. The uncontrolled vari­ables in real classrooms — the social interactions of the class, the teacher’s talents, the prior knowledge of the individual students ­have made causal conclusions difficult to determine with confidence. Such difficulties were among the reasons given in a recent report of the National Research Council as to why no program or methods of teaching mathematics had been scientifically determined to be supe­rior to any other. In reaction to such past defects of educational research, the In­stitute of Educational Sciences has recently instituted rigorous stan­dards for data gathering, including an insistence on random assign­ments of students to experimental and control groups, on the pattern of good medical research. These are admirable advances. The more reliable the data we obtain are, the more reliable our theories will be. But good theory is not to be confused with good data-gathering tech­niques alone. The need for a deep general analysis is not obviated by even the best data-gathering techniques. The random assignment of students into control groups and experimental groups is an admira­ble method for gaining higher confidence in statistical results but cannot by itself explain the underlying reasons for the statistical re­sults nor by itself allow confident predictions that they will be re­peated in new circumstances. Good data gathering does not by itself support the inference that what has worked in one place will work in another. It won’t do to regard research results as a black box from which it can be directly ar­gued, for instance, that since smaller class size led to better results in Tennessee, smaller classes will also lead to better results in California. The famous and expensive Tennessee STAR study (Student Achieve­ment Teacher Ratio) was exemplary in its data-gathering techniques, using large numbers of students randomly assigned into control and experimental groups. Since the data gathering was so well conducted, policymakers in California reasoned that the results would apply to California and put that line of reasoning into effect at an estimated cost of $5 billion extra – without significant results. To infer reliably that carefully gathered results are replicable, one cannot treat them atheoretically. Data about what works in schools cannot necessarily simply be gathered from schools and then applied directly to improve different schools without the benefit of deep analysis and general pre­dictive theory. To apply results elsewhere, one needs to understand in detail the causal factors that would allow confident predictions. What are the generalizable factors that make smaller class size more effec­tive for earlier grades than for later ones? What are the replicable causes of student gain through smaller classes? One important theoretical consideration too often neglected in educational research is that of opportunity cost. The multimillion­dollar Tennessee class-size study, while admirable for its random as­signments and statistical punctiliousness, did not adequately address theoretical questions concerning unanalyzed opportunity costs. Could there be alternative, more reliable, and more cost-effective ways of achieving similar or higher gains? If, for example, an impor­tant advantage of smaller class size is more interaction time between student and teacher, are there alternative, less expensive policies for achieving more interaction time and still greater student gains? In other words, the Tennessee STAR study did not hazard a clear and detailed theoretical interpretation and generalization of its own find­ings. If it had, the state of California, basing its policy on the STAR study, might not have spent $5 billion in an unsuccessful effort to im­prove achievement simply through smaller class size. Theory must always outrun data to provide a context for inter­preting data and to justify predictions. Since educational data are of­ten conflicted and uncertain, educational theories are too often sim­ply ideological stances in disguise. It is against this backdrop that I proffer the following proposition: at any given time, it is our duty to work out the most probable theoretical analysis of a practical educa­tional problem in the light of all the relevant research from all rele­vant areas, and to resist being distracted on the one side by the latest research bulletins and on the other side by people who say skeptically that educational data are too complex so we’ll stick to our educa­tional philosophy. An adequate theory of reading will recognize that reading comprehension is a subcategory of language comprehension, and that language comprehension must entail attributes that often re­main unmentioned in discussions of reading, especially the idea of the speech community. For communication to occur by means of language, the two sides (call them either speaker/listener or author/reader) have to learn and share the same language rules. For instance, a child learns that when a speaker says you to the child, it means the child, and when the speaker says I, it means the speaker. But when the child speaks, I means the child and you means the person being spo­ken to. The words take on different meanings — refer to different people – depending on the speaker, and this is a language rule that any comprehender must learn. A whole host of such tacit agreements are necessary to communication. The British philosopher H. P. Grice made a considerable reputation by explaining in a few pages the structure of many of these unspoken agreements. The group of peo­ple who share these agreements is a speech community. Sharing the unsaid makes it possible for them to comprehend the said. It is the very thing that makes them a speech community. Poor readers who can decode adequately but cannot comprehend well are usually read­ers who lack knowledge of a whole array of unspoken informa­tion being taken for granted by insiders in the speech community. To supply students with this unspoken, taken-for-granted knowledge as efficiently as possible should be the goal of a good reading program. Scientific theories, explicit or implicit, have enormous practical rami­fications. 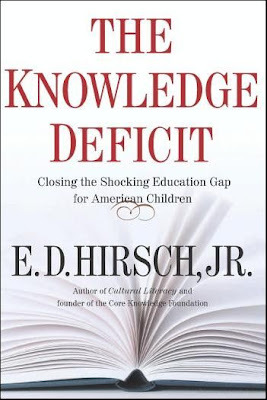 It was theory and not decisive data that caused current reading programs to include trivial, disconnected reading materi­als and to allot too much time and effort to the teaching of formal comprehension strategies. Proponents of the strategies could point to data that showed some improvements after a few weeks of strat­egy instruction. (Most educational interventions can supply positive data.) But these improvements were not large. And long-term data regarding strategy instruction are even less impressive. If the long­term data favoring these practices had been decisive, we would not be having a nationwide reading comprehension problem. As I have sug­gested, the existing research on this issue better supports a contrary theory which is far more consistent with findings of cognitive science. This countertheory holds that extensive comprehension strategy in­struction, while showing brief initial results for easily adduced rea­sons, is not a productive use of instructional time. This theory is well based on data and on a broad range of studies concerning the nature of language comprehension. Which theory is to be preferred? A useful example of how to resolve conflict among empirical educational theories — until clearly decisive empirical results arrive — comes from physics, a field in which there have been uncertainties just as great as those found in education. As recently as 1900 the exis­tence of atoms was a matter of active dispute among scientists. The knotty theoretical problem of the existence of atoms goaded young Albert Einstein, into his earliest work, from his doctoral dissertation of 1905 through several great articles on Avogadro’s number (N) in 1905 and 1906. Einstein approached the question of N (the number of molecules in a given amount of matter) from a lot of different angles — blackbody radiation, the flow of solutions, Brownian motion, and the blue of the sky. He showed that all of these independent methods of determining N yielded a very similar number. Since each of these sources of computation was quite independent of the others, this in­dependent convergence made it very hard to doubt the atomic the­ory. In framing theories that will guide fateful policy decisions about educating our children, this pattern of independent data convergence should be our goal. In teaching children to become good readers, we need to ask hard questions about the relative efficiencies of conflicting instruc­tional methods, several of which, like the STAR experiment, have an apparently good basis in research. The fact that a method has been shown to yield positive effects on reading comprehension or vocabu­lary gain doesn’t mean that it meets the more stringent theoretical re­quirement of attaining these positive effects efficiently. These are the kinds of issues that a teacher, school administrator, or policymaker needs to have addressed, and it is the duty of the researcher who is fa­miliar with both the data and the relevant literature to ponder and try to answer these theoretical questions about opportunity cost, quite apart from ideology and educational philosophy. Coming back, then, to our example of strategy instruction, the theory supporting spending a lot of time in teaching reading compre­hension strategies is a good example of nonconvergence. It is in con­flict with much that has been learned about the gaining of expertise and the workings of the mind. The reading strategy theory initially took note of a narrow range of data: expert readers tend to monitor their own performances. Then the theory took an unwarranted leap: if that is what expert readers do, we will take a big shortcut by teach­ing novices how to monitor their performances. While some of the subsequent data did appear to support this approach, other data sug­gested that conscious self-monitoring is not the path that experts ac­tually take to become experts. Studies of expertise have consistently shown a very slow development of high skill (ten years is close to the minimum time). Still other data indicate that active self-monitoring can be done effectively only after the person has become an expert –for reasons having to do with the limitations of channel capacity in the human mind. This evidence argues against burdening the nov­ice’s mind with self-conscious strategizing. Still another theoretical shortcoming of the strategy idea was its unspoken but incorrect as­sumption that these "metacognitive" comprehension strategies are formal, transferable activities that can be deployed independently of content knowledge. A better theory that accounted for a larger range of evidence would have avoided these scientific shortcomings and a tragic waste of classroom time. Stressing the importance of theory might be considered a sign of indifference to educational data. But of course the contrary is the real case. Careful attention to achieving the most probable theory is the best way to take account of the greatest possible amount of rele­vant data. It’s the best way of not being diverted from sound educa­tional policy by some fresh bulletin from the schools that may or may not truly show what it claims to show. Suppose somebody comes up with a claim for a program that, according to research, can bring a child from low language comprehension to proficient language com­prehension in one school year. This is not, perhaps, an absolute im­possibility, but on strong theoretical grounds having to do with the gradual nature of knowledge and vocabulary acquisition, we need to be especially wary of claims to quick fixes in reading proficiency. There is a lot of evidence that although language development can be accelerated, it can never be really fast. We know this because we are beginning to have a deeper understanding of the way vocabulary and its accompanying knowledge is built up. This theoretical understand­ing can enable us to speed up progress in near-optimal fashion even as it repudiates the notion that Seabiscuit-style progress is possible in reading comprehension. A theoretical understanding of the slow gradualism of gains in reading is an important consideration in taking practical steps to­ward implementing the practical recommendations of this book. Im­portant test data on reading gains might not become available until a few years after these recommendations are put into practice. After three to five years, however, the gains predicted from theory (and from existing data) will be dramatic. Moreover, until a better the­ory of optimal reading instruction comes along, these reading gains should be considered the fastest gains that a school program can achieve. In general, as schooling proceeds on its slow, cumulative way, we continually need to rely on good theory - not on isolated pieces of data but rather on the largest possible array of data, which is what good theory by definition embraces. The two ideologies or philosophies that dominate in the Ameri­can educational world, which tend to corrupt scientific inferences, are naturalism and formalism. Naturalism is the notion that learning can and should be natural and that any unnatural or artificial ap­proach to school learning should be rejected or deemphasized. This point of view favors many of the methods that are currently most praised and admired in early schooling — "hands-on learning," "de­velopmentally appropriate practice," and the natural, whole-language method of learning to read. By contrast, methods that are unnatural are usually deplored, including "drill," "rote learning," and the analyt­ical, phonics approach to teaching early reading. We call such natu­ralism an ideology rather than a theory because it is more a value sys­tem (based historically on the European Romantic movement) than an empirically based idea. If we adopt this ideology, we know in advance that the natural is good and the artificial is bad. We don’t need analysis and evidence; we are certain, quite apart from evidence, that children’s education will be more productive if it is more natural. If the data do not show this, it is because we are using the wrong kinds of data, such as scores on standardized tests. That is naturalism. Formalism is the ideology that what counts in education is not the learning of things but rather learning how to learn. What counts is not gaining mere facts but gaining formal skills. Along with natu­ralism, it shares an antipathy to mere facts and to the piling up of in­formation. The facts, it says, are always changing. Children need to learn how to understand and interpret any new facts that come along. The skills that children need to learn in school are not how to follow mindless procedures but rather how to understand what lies behind the procedures so they can apply them to new situations. In reading, instead of learning a lot of factual subject matter, which is potentially infinite, the child needs to learn strategies for dealing with any texts, such as "questioning the author," "classifying," and other "critical thinking" skills. Both naturalism and formalism are powerful because they are attractive and, rightly understood, contain much truth. We would all be better off if they were entirely true, in which case American schools would be making a far better showing on international compulsions. But insofar as they function as empirical theories, they are in their unqualified forms very inadequate and are at odds with what is known in relevant scientific fields. Naturalism is at least partly wrong in all those cases where the things to be learned (like alphabetic decoding) are historically late, artificial products of civilization. There is no natural, innate alpha­betic learning faculty in children’s minds comparable to their innate oral language faculty. Naturalism is mainly right about first-language learning and, as we observed in Chapter 4, about vocabulary acquisi­tion, but it is in error in trying to conflate oral language learning and alphabetic phonics. Similarly, the base-ten number system, like the alphabet, is a nonnatural system, and there are no good empirical grounds for thinking that a naturalistic approach to learning the op­erations of the base-ten system will work very well, as in fact it does not. However, it is also very unlikely that a harsh, unnatural, drill­-and-kill approach to either the alphabet or the base-ten system will work best with young children. Consideration of the defects and strengths of naturalism, embracing what psychology knows about these issues, is best described not as part of a fight-to-the-death, liberal-vs.-conservative ideology but simply as a sounder empirical theory. The same qualifications need to be made about the ideology of formalism. In some respects the learning-to-learn idea is correct. It is true, for example, that the child needs to be able to learn new things through reading. It would therefore appear necessary that learning how to learn is a more important educational goal than learning mere facts and subject matter. But we have already alluded to the firm empirical finding that in order to understand a text, the child has to have prior knowledge about its domain. That would argue for the theory that teaching the child a lot of domains is itself a necessary ele­ment in learning to learn. This suggests a theoretical middle ground between formalism and antiformalism. The antiformalists are right to stress that general reading ability must necessarily be founded upon general knowledge — on a lot of "mere information." The for­malists are right to insist that the goal of such an education is not pri­marily to possess this information in itself but to possess it as a means of learning to learn. Externally, therefore, the formalist goal is one that can be accepted. What good empirical theory has to offer is the complicating insight that the only way to achieve the goal of learning to learn is through something that the formalist ideologue disdains – a lot of diverse information. It will be possible to decide whether the foundations of the the­ory correspond with the facts only if a great variety of observa­tions is at hand . . . In my opinion, both [the alternative theories of Abraham and Bucherer] have rather slight probability, be­cause their fundamental assumptions concerning the mass of moving electrons are not explainable in terms of theoretical sys­tems which embrace a greater complex of phenomena. The key phrases are "great variety of observations" and "embrace a greater complex of phenomena." Ultimately Einstein was shown to be correct, and the overhasty inferences from rigorous but narrow data gathering were wrong. Einstein understood the criti­cal importance of accepting for the time being only those conceptions that converge independently from the widest complexes of phenomena. This is a point that Steven Weinberg makes very amusingly. Using the example of medical research, which is similar to educa­tional research in many respects, he cautions that mere experimental and statistical methods can be highly dubious without the explana­tory support of fundamental science. Medical research deals with problems that are so urgent and dif­ficult that proposals of new cures often must be based on medi­cal statistics without understanding how the cure works, but even if a new cure were suggested by experience with many patients, it would probably be met with skepticism if one could not see how it could possibly be explained reductively, in terms of sciences like biochemistry and cell biology. Suppose that a medi­cal journal carried two articles reporting two different cures for scrofula: one by ingestion of chicken soup and the other by a king’s touch. Even if the statistical evidence presented for these two cures had equal weight, I think the medical community (and everyone else) would have very different reactions to the two ar­ticles. Regarding chicken soup I think that most people would keep an open mind, reserving judgment until the cure could be confirmed by independent tests. Chicken soup is a complicated mixture of good things, and who knows what effect its contents might have on the mycobacteria that cause scrofula? On the other hand, whatever statistical evidence were offered to show that a king’s touch helps to cure scrofula, readers would tend to be very skeptical because they would see no way that such a cure could ever be explained reductively... How could it matter to a mycobacterium whether the person touching its host was prop­erly crowned and anointed or the eldest son of the previous monarch? Without greater theoretical sophistication, we are unlikely to achieve better practical results in education. With greater theoretical sophistication, educational research might begin to earn the prestige that it currently lacks but, given its potential importance, could some day justify. The place to begin is with reading.